Nineteen-year-old Momoko has managed to pass the entrance exam of a university in Tokyo, and her mother has decided that she will stay with her aunt, a middle-aged novelist who lives in the Meijiro neighborhood of West Tokyo. Momoko’s aunt is a free spirit with a difficult personality, but that’s just fine with Momoko, who is more than a little quirky herself. Momoko occasionally goes to class or goes out drinking, and her aunt occasionally gets her act together and publishes something, but mostly they hang around the house together being useless. Indian Summer was published in 1988, the same year as Yoshimoto Banana’s famous girls’ literature novella Kitchen, and both stories reflect the heady energy of the consumer culture at the end of the bubble years. Unlike Kitchen, however, Indian Summer has more of a satirical bite, with Momoko expressing a lazy disdain for the sort of concerns celebrated by women’s magazines, such as clothing and romance. One target of Momoko’s annoyance is her divorced father, who lives in Tokyo and works as a hotel manager. He makes a series of clueless attempts to bond with his daughter by taking her out to nice stores and fancy restaurants and offering fashion advice, but Momoko is not impressed. Her main concern is avoiding the girlfriend for whom her father left her mother, but this “girlfriend” turns out to be a beautiful young man. To Momoko’s complete lack of surprise, gay romance turns out to be just as tawdry and boring as straight romance, for which she has zero patience. Momoko lets off steam with her college friend Hanako, whose father is also an embarrassment, especially in his insistence that his precious daughter is too good for things like a part-time job. Neither of the girls particularly cares what any men think of them, however, and in their lack of concern they are passively supported by Momoko’s aunt, who just wants to drink and write. These three women drift through their days together, not marching to the beat of any drum at all as they enjoy each other’s company. Sometimes they talk about their lives, and sometimes they talk about books and movies, but mostly they just chill out. Because of the charm and wit of Kanai’s writing, this is a lot more interesting than it sounds, but there’s no denying that Indian Summer is a light and refreshing novel that isn’t meant to challenge its reader. Interspersed between the chapters of the novel are Momoko’s aunt’s essays on everything ranging from motherhood to abortion to Roland Barthes to the foibles of bourgeois women. These short interludes are inspired by the aunt’s day-to-day life with her niece and provide a sort of parallax view on the events of the story. While Momoko tends toward a negative assessment of the world around her, her aunt’s opinions are more tongue-in-cheek, but the two women are still very much alike in their casual nonchalance. Because of its inclusion of these “non-fiction” essays, and because of its lack of a clearly definable plot, Indian Summer is a strange little book that’s difficult to categorize. That being said, Kanai’s writing is a lot of fun and genuinely humorous. I would recommend this short novel to people who enjoy the breezy sort of fiction characteristic of 1980s Japan but who would appreciate something a bit more grounded and intelligent than the romance and science fiction from that decade that had previously appeared in translation. A year after her father dies in a suicide pact, twenty-something Mitsuharu Yoshie moves to the hipster neighborhood of Shimokitazawa, where she works part-time at a small bistro. Everything is going reasonably well for her until her mother suddenly decides to move in with her. Yoshie had been looking forward to leaving the nest and striking out on her own, but her mother claims that her father’s ghost has begun to haunt their old apartment, so what can she do? Moshi Moshi is like a glossy lifestyle magazine in the form of a novel. Yoshie and her mother float through their days in Shimokitazawa, eating delicious food, buying nice things, and gradually getting to know their neighbors. Yoshie is serious about her work in the Les Liens bistro, and her mother is serious about pulling herself out of the mire of her former role as a housewife, but they have no money worries and are quite comfortable together. The only shadow on their bright days is the death of Yoshie’s father Imoto, who played keyboard in a rock band. The official story is that he committed suicide with a much younger woman, but neither Yoshie nor her mother has any idea why an otherwise grounded and stable man would have consented to such an extreme act of desperation. One day, Yoshie randomly runs into a frequent diner at her bistro. The man’s name is Shintani, and he happens to own a club where Imoto’s band often played. Shintani takes this opportunity to tell Yoshie that there was something very strange about the woman her father ran off with. He also tells Yoshie that he’s falling in love with her. When I saw her reading manga with her belly out, shedding tears while murmuring, “I understand, of course you want to go back and live in the cave,” I was filled up with the thought that this woman hadn’t done anything wrong, and didn’t deserve any of this. This laid-back atmosphere is occasionally juxtaposed against Yoshie and her mother’s former home in Meguro, a pricey neighborhood just south of Shibuya. Meguro is too upscale for the two women to be true to themselves, but they’re finally able to relax and find a comfortable community in Shimokitazawa, which welcomes sweet and slightly quirky people into its patchwork of quaint stores and cafés. The last sentence in the author’s Afterword aptly sums up the message of the book: “I only pray for the survival of all the many fine shops that still quietly continue to exist” (206). Moshi Moshi has something vaguely resembling a plot, but the story isn’t really the point of the novel. Rather, the reader is bathed in the warm flow of Yoshimoto’s words while experiencing of the charm of the Shimokitazawa neighborhood. The novel is comforting, like drinking hot chocolate on a cold day. Just don’t expect any bold or complicated flavors, and you won’t be disappointed. Kano Misao and her husband Teppei have found the perfect apartment. It’s quiet and spacious with southern exposure, and it’s in a new, modern building. Sure, this building happens to be right next door to a graveyard, but it’s the 1980s, and the pleasant proximity to an open green space outweighs any sort of silly superstitious stigma. The only problem is that strange things always seem to be happening in the basement. It might be that the building is haunted, but why? And what would the ghosts want from Misao and Teppei? Like many other haunted house stories, The Graveyard Apartment is, at its heart, a family drama. Misao and Teppei are happy together with their five-year-old daughter Tamao and their dog Cookie, but the bright little family is trailed by the dark shadow of Teppei’s first wife Reiko, who was driven to suicide by her husband’s affair with Misao. When the stress of the paranormal activity in their new apartment places stress on Misao and Teppei’s relationship, the fault lines of their marriage begin to crack. The novel opens inauspiciously with the death of Tamao’s pet bird Pyoko, who the girl claims now visits her in dreams. Misao and Teppei’s disagreement over how to handle their daughter’s insistence on the reality of the supernatural is the first of many arguments, which gradually escalate over the course of the story. The Graveyard Apartment is not The Shining, however, and the ghosts troubling the family are not manifestations of buried psychosexual traumas – they are, most assuredly, actual vengeful spirits. The horror of the novel derives from the fact that, despite the lingering guilt over Reiko’s suicide, the malice of the building’s ghosts could not be directed at a more normal and easygoing family. If a sweet young mother and fledgling illustrator like Misao can find herself trapped in a claustrophobic basement while unknown things approach unseen in the darkness, it could happen to anyone. It turns out that the apartment building is a remnant of a failed development project from the 1960s that would have resulted in an underground shopping plaza connecting the basements of several office and residence buildings to the local train station. The neighborhood temple resisted this development and refused to sell or subdivide its land, however, and so the tunnel under the graveyard was left unfinished, with the Kanos’ building the only part of the project that came to fruition. The link between the temple graveyard and the ghosts in the basement is extremely tenuous (especially since the point of Buddhist funerary rites is to pacify angry spirits), but the haunting can be more easily understood as the consequences of the era high economic growth, which has finally started to claim victims as the bubble economy begins to collapse in on itself. The Kanos were led to believe that they could have it all – Teppei could divorce his old-fashioned wife and marry for love, Misao could have both a child and a freelance career in a creative field, and they could find a reasonably priced apartment in a convenient location to house their happy family. It had to be too good to be true, right? Originally published in 1988, The Graveyard Apartment is a reflection of the anxieties concerning the optimistic consumerism of the 1980s, in which an ideal middle-class lifestyle was widely considered to be glossy and attainable as the magazines Misao illustrates. Although the real threat to families ended up being overinflated property values, Koike’s ghosts are creepy enough on their own even without any sort of economic allegory, and the end of the novel is genuinely disturbing. The Graveyard Apartment is a satisfying slow burn of a haunted house story perfectly suited to its setting in Tokyo, and I highly recommend it to my fellow fans of horror fiction. This is a perfect description of The Book of Tokyo, which offers the reader less of a detailed illustration of an urban landscape than it does a vivid sense of the energy and potential generated by a city inhabited by 13.5 million people, every one of whom has a story. In Furukawa Hideo’s “Model T Frankenstein,” a monster that may or may not be a shapeshifting goat escapes one of the Izu Islands on a ferry and makes his way to Tokyo to assume a new identity as a ‘Japanese.’ He has to kill a few people along the way, but he eventually makes a home for himself in Shinjuku. In “Picnic,” Ekuni Kaori sketches a relationship between a disaffected couple whose hobby is to have designer picnics in a park by their house, an activity that makes them marginally less alienated from one another. Kakuta Mitsuyo’s “A House for Two” is an ode to the trendy comforts of urban living. The pleasure the narrator derives from walking through the city has its roots in her relationship with her mother, whom she whom once bonded with over luxurious foreign clothes and who now commands a greater share of her affections than any man ever could. The cosmopolitanism of Tokyo is on full display in Horie Toshiyuki’s “The Owl’s Estate,” in which the male narrator, a sushi chef and secondhand book dealer, finds himself in a strange rundown building in West Ikebukuro inhabited by foreign girls of dubious employ. In the end, though, there’s nothing particularly French or Australian or American about the way these girls enjoy drinking and laughing and being silly with each other. The single father protagonist of Yamazaki Nao-Cola’s “Dad, I Love You” must navigate his way through a maze of foreign brand names, cuisines, and business owners over the course of his day before coming home to his daughter, who encourages him to keep going with the joy she finds in things that transcend culture, such as how large the full moon looks in a clear night sky. The young woman who narrates Kanehara Hitomi’s “Mambo” doesn’t even care where she’s going when she gets into a taxi with a stranger; she’s just looking for adventure in the city. Yoshimoto Banana’s “Mummy” encapsulates the theme of the entire collection, which is that every random encounter between strangers is accompanied by a galaxy of possibilities. A female undergrad agrees to be walked home by a male graduate student studying Egyptology. He cautions her that there’s a killer loose in the neighborhood, and it would be unsafe for her to go out alone. She suspects that he might be the murderer, but her physical attraction to him is so strong that she resigns herself to her fate. Although the grad student isn’t a criminal, he does turn out to be a complete weirdo, and the narrator has to forcibly restrain herself from judging him and the course his life takes after they go their separate ways. When surrounded by so many potential paths, she asks herself, how do you know that your own is “necessarily the correct and happiest one” (52)? My favorite story in the collection is Kawakami Hiromi’s “The Hut on the Roof.” The main setting is an izakaya pub, where the divorced narrator, an English teacher, eats and drinks and hangs out with older men from her neighborhood. After becoming close to them through the process of exchanging casual but repeated interactions, she eventually learns the story behind the peculiar living arrangement of a local fishmonger who has befriended her. The story doesn’t have a plot, exactly, but it conveys an almost palpable sense of living your own individual life surrounded by people whom proximity has drawn into a loose yet friendly community. Don’t let the cover fool you – despite the flying cranes and Shintō gate and temple and Chinese lanterns, the The Book of Tokyo is refreshingly contemporary. None of the stories translated for the collection was published before 2000, and reading them feels like walking through the twenty-first century just as much as it feels like walking around Tokyo. 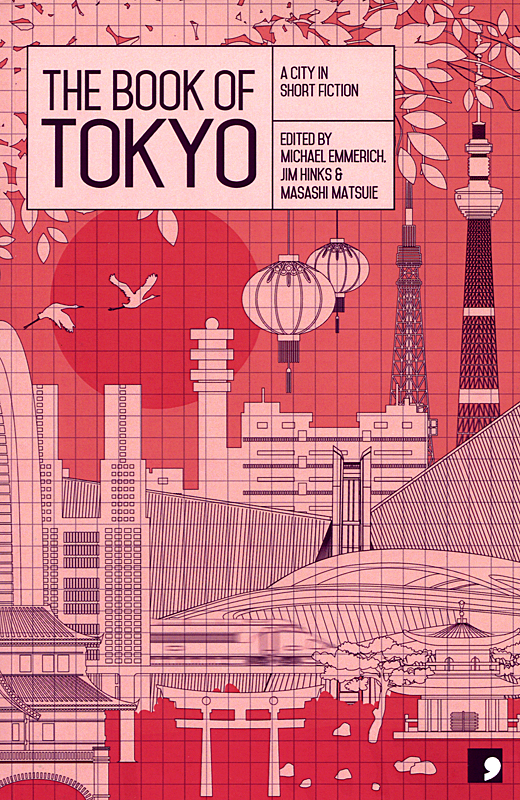 As Emmerich notes, it’s difficult to pin down the “Tokyo-ness” of these stories, but the reader who encounters them can’t help but be drawn into the living and breathing atmosphere of a huge and dynamic city. The editing and story selection of The Book of Tokyo is excellent. I was so impressed that I ended up ordering several other titles in Comma Press’s “Reading the City” series, which include The Book of Gaza, The Book of Rio, and The Book of Liverpool. Review copy provided by the wonderful people at Comma Press. In the late Meiji Period, as Japan undergoes the process of modernization, Hoshino Mone is a student at an all-girls private high school in Tokyo, where she lives with her male guardian, Sei. Although a young woman’s duty is to be beautiful and modest so as to become a suitable bride, Mone has a different dream – she wants to write literature! 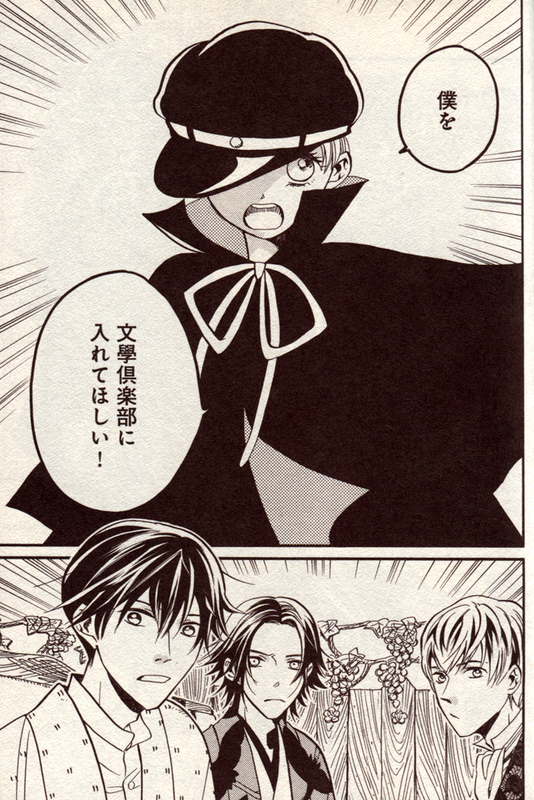 Literature (the bungaku of the manga’s title) is believed to corrupt women, so Mone cuts off her braids, dons schoolboy clothing, and joins an all-male literature club. Although she must face a bit of drama concerning her choices, the friends Mone makes help her hone her talents and offer her inspiration as they take her on adventures around town. 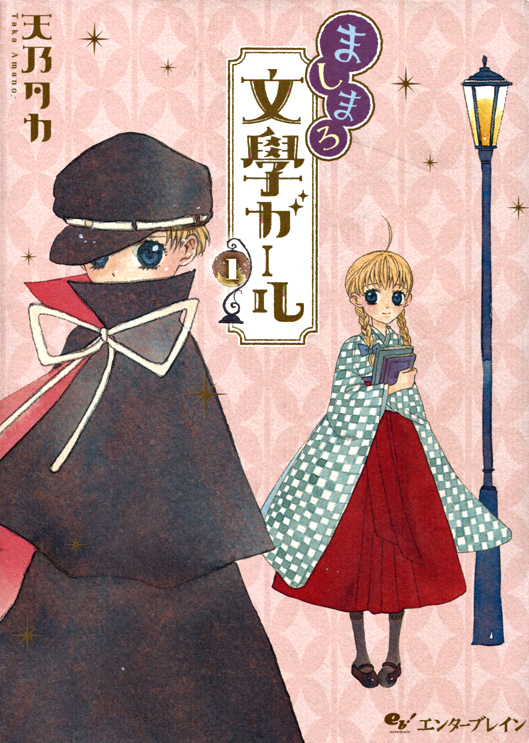 The handsome young literary illustrator Nasuhito knows Mone’s secret but believes in her potential. Nasuhito’s respect for Mone as a fellow artist is not the only source of his warm feelings for her, however. Although Bungaku Girl was published in the seinen magazine Fellows! – the former name of Kadokawa’s prestige-format monthly serial Harta (ハルタ) – it reads like a shōjo manga from the 1990s, when the influence of series such as Fushigi Yûgi and Cardcaptor Sakura injected elements of gender bending and bishōnen harems into even the most prosaic romance stories. All of the young men in the literature club are impossibly gorgeous, and everyone is decked out in immaculate period dress. There’s a hint of yuri provided by the radiant high school princess Sono, another literature fan who becomes enamored of Mone’s courage and independent spirit, but there are no elements of the male gaze to be found in the manga’s story or art. Instead, there are touches of Mori Kaoru in the close attention paid to historically accurate fabrics, interiors, street scenes, and city vistas. Bungaku Girl is less about Mone’s cross-dressing and gender identity than it is about her commitment to doing whatever it takes to find a supportive community for what she loves. Many of the story’s most powerful moments occur when the characters are being creative – when Mone is writing, or when Nasuhito is drawing, for instance – and these moments are reinforced by being framed within the sense of belonging to a group of people all working together to share their ideas and produce something tangible. For us nerds who have studied modern Japanese literary history, there are pleasurable echoes of the student groups, coterie magazines, and research trips into pleasure districts associated with real-life literary figures. This two-volume series is only available in Japanese, but it would be really cool if someone were to license it in North America. The story is simple and charming, the characters are adorable, and the art is clean and attractive. Bungaku Girl offers love, drama, and interesting imagery, not to mention encouragement to leave your comfort zone and live your dreams! I… want to join your literature club!